Interact Magazine is a free, quarterly student-focussed publication distributed free to universities, colleges, youth communities and faith groups across London with an interfaith ethos behind it. We aim to bring together an voluntary editorial team of 18-25 year old from diverse backgrounds to create a unique issue every 3 months which reflects the cultural diversity and political interests of London's student population. Whether it's politics, the arts, media, culture or travel, we include every possible topic that our readers could be interested in, and our team get an excellent experience of what it's like making and contributing to a magazine. 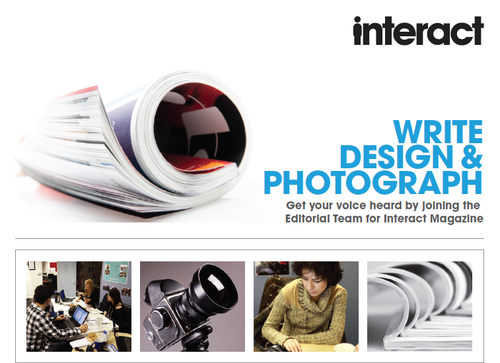 Want to get involved with the Summer 2012 edition of Interact Magazine? Can you write or edit? Good PR and Marketing skills? We need interns to come in ideally 2-3 days a week to co-ordinate the Summer Magazine Editorial Team. Excellent organisational and interpersonal skills are a must, and previous experience at team management or journalism would be great. The roles will entail tasks such as advertising for, recruiting, interviewing and then managing all members of the editorial team, running the weekly meetings, keeping in touch between meetings to make sure articles and designs are on track and exercising editorial authority where needed. Occasionally media mentors - professionals from the media industry - will be joining the meetings as speakers and guest supervisors, offering their expertise, and it will be part of the intern's role to source and organise them. The role is suited to a bright individual who can work independently as well as part of a pair and team. We want writers who are 18-25 years old with an interest in gaining more journalism experience and who would want to contribute articles on interfaith issues, politics, society, culture, the arts, fashion, food, film, music, events - essentially anything and everything. The last few issues have had excellent content with high-quality writing, and we're very keen to maintain the standards. It'll be distributed round London universities so if you feel you have a voice that reflects that of your London-student peers, you should definitely get involved. The position requires attendance at a one-hour weekly meeting at our Kentish Town offices. In addition, work for the magazine should take up at most 4-5 hours a week in your own time. This is an excellent opportunity for graphic designers to experiment with their creativity whilst getting some journalism experience too. We want graphic designers who, whilst having a sympathy for our interfaith values, can also demonstrate exciting ideas in print. If you feel you have what it takes to design articles about politics, culture and student issues then definitely get involved. All work is done outside of meetings so if you can commit up to 3-4 hours of your own time each week to getting the work done, this role is perfect for you. Examples of previous work will be requested upon interview. The position requires attendance at a one-hour weekly meeting at our Kentish Town offices. Otherwise, work for the magazine should take up at most 4-5 hours a week in your own time. We're looking for photographers who want more experience shooting excellent images for a magazine. They have to be willing to travel and work with writers to take relevant photos for articles, as well as being a team-player and using their initiatives to capture images that they feel will be useful for the magazine. Examples of previous work will be requested upon interview. In order to get the magazine printed, we need funding from advertisers. If you have a little marketing experience and would like to gain more, or feel that you have the relevant skills to offer for this position then get in touch. Our marketing reps should be both persistent and innovative in their methods to get us funding, and look for creative ways to advertise the magazine to our target audience - London students. Our marketing reps will also be in charge of organisation behind the magazine getting printed, and will do this by liaising with the printers. If you are interested we would love to hear from you! Contact: richard@interact-uk.org.uk. Applications will be accepted until 29th March 2012. These roles are unpaid but travel expenses will be covered.